The nail in the coffin of “equal justice under law” came on November 24, when the St. Louis County grand jury refused to indict Wilson for any criminal charges in the shooting death of Brown. In a virtually unprecedented move, St. Louis Prosecutor Robert McCulloch in effect deputized the grand jurors to sit as triers of fact as in a jury trial. The standard of proof for a grand jury to indict is only probable cause to believe the suspect committed a crime. It is not proof beyond a reasonable doubt, which is required for conviction at trial. Yet McCulloch’s team presented testimony and documents to the panel for three months, evidence not subjected to adversarial testing by cross-examination. [I]t is the grand jury’s function not “to enquire . . . upon what foundation [the charge may be] denied,” or otherwise to try the suspect’s defenses, but only to examine “upon what foundation [the charge] is made” by the prosecutor. [citations omitted] As a consequence, neither in this country nor in England has the suspect under investigation by the grand jury ever been thought to have a right to testify or to have exculpatory evidence presented. The prosecutor did not ask these grand jurors for an indictment. They were left to sift through the evidence on their own, with no prosecutorial guidance about what to charge. Indeed, the transcripts indicated that prosecutors asked Wilson gentle, leading questions designed to bolster his self-defense claim. For example, a prosecutor told Wilson, “You felt like your life was in jeopardy,” followed by, “And use of deadly force was justified at that point, in your opinion?” But prosecutors rigorously challenged witnesses who contradicted Wilson’s testimony. 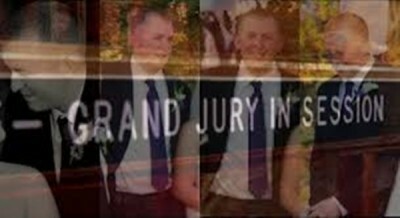 As the grand jury is a secret proceeding, with only the grand jurors and the prosecutor present, the grand jurors did not hear any cross-examination of the officer’s testimony, or that of other witnesses (which is customary in an adversarial jury trial). These grand jurors, who were nearing the end of their term, which began in May, knew the drill, since they had sat on several other cases. They knew the prosecutor always asks for indictments. Thus, when the prosecutor handled the Wilson case in a radically different manner, this signaled to the grand jurors that they were not expected to indict. And they did not. Another unorthodox aspect of this case was McCulloch’s announcement of the grand jury’s decision on national television. Sounding like a defense attorney delivering a closing argument in a jury trial, McCulloch characterized and analyzed the witness testimony in the light most favorable to the officer. McCulloch had mischaracterized testimony in a 2000 case in which two black men were killed after officers fired 21 shots at them. As in the Wilson case, the reasonableness of the officers’ use of deadly force was critical. In the 2000 case, the officers said the two victims were driving toward them, trying to run them down, and McCulloch claimed that all the witnesses corroborated the officers’ story. A later federal investigation, however, determined that the car was not moving forward, and that only three of the thirteen officers said the car was moving forward. Likewise, Wilson’s claim that Brown was “charging” at him when the officer fired the fatal shots into the top of Brown’s bowed head was critical to the reasonableness of Wilson’s use of deadly force. When McCulloch announced the grand jury’s decision, he characterized the witnesses who testified that Brown was “charging” the officer as believable, but dismissed the testimony of witnesses who said Brown was surrendering. McCulloch sounded like a defense attorney, not a prosecutor charged with representing “the people,” including Brown. Wilson fired 12 shots at Brown, six of which struck the teenager. There was a great deal of contradiction among the witnesses, including whether Brown’s hands were up or down when Wilson shot at him. That is precisely why there should have been an indictment and a jury trial. Jurors would hear all of the evidence, subjected to adversarial testing by cross-examination. They would assess the credibility of the witnesses, and determine whether Wilson had committed any crime(s) beyond a reasonable doubt. Dorian Johnson, the key witness who was standing next to Brown during the encounter, provided strong testimony that called into question Wilson’s claim that he was defending his life against a deranged aggressor. Johnson testified that Wilson, enraged that the young men did not obey his order to get on the sidewalk, threw his patrol car into reverse. While Wilson claimed Brown prevented him from opening his door, Johnson testified that the officer smacked them with the door after nearly hitting the pair. Johnson described the ensuing struggle as Wilson attempting to pull Brown through the car window by his neck and shirt, and Brown pulling away. Johnson never saw Brown reach for Wilson’s gun or punch the officer. Johnson testified that he watched a wounded Brown partially raise his hands and say, “I don’t have a gun” before being fatally shot. A police officer in Missouri can use deadly force in making an arrest or preventing escape if he reasonably believes it is necessary to effect the arrest and also reasonably believes the person to be arrested has committed or attempted to commit a felony, or may otherwise endanger life or inflict serious physical injury unless arrested without delay. The key word is “reasonably.” The jury would be told to consider whether a deadly weapon was used, how far apart Wilson was from Brown when the former used deadly force, any disparities in the sizes of the two, the crime involved, etc. The evidence was contradictory about the distance between the two during the confrontation, both Wilson and Brown were the same height but Brown was heavier, and the officer contradicted himself about whether he knew that Brown was suspected of committing petty theft for stealing cigarillos (a misdemeanor, not a felony) before the officer stopped him. In Tennessee v. Garner, the Supreme Court held that an officer cannot arrest an unarmed felony suspect by shooting him dead. If the suspect threatens the officer with a weapon, or there is probable cause to believe he has committed a crime involving the infliction or threatened infliction of serious physical harm, deadly force may be used if necessary to prevent escape. Although there is a dispute about whether Wilson knew that Brown was suspected of stealing cigarillos before stopping him, Brown had likely committed petty theft – a non-violent misdemeanor, not a felony.